Benchmade, founded by Les de Asis around 1987 and with current headquarters in Oregon City, originally became known to the public for the production of Bali-Song, "butterfly knives", from which it derives, however, the brand. 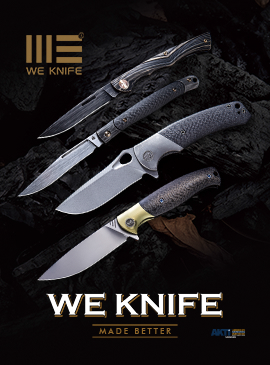 The use of high-end materials, the numerous collaborations with famous knife makers and a particular attention to the needs of its audience, have led Benchmade to divide the large catalog of products into "use classes". In the orange color the Hunt category stands out, obviously dedicated to the hunting art. 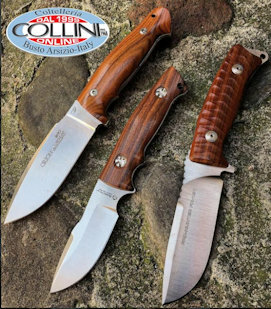 The Saddle Mountain Skinner and Hidden Canyon Hunter models are full tang fixed blade knives, whose finishes and similar design make them a perfect matchup. Both models feature a CPM-S30V sintered stainless steel blade (58-60 HRC), a material that conferes an high cutting edge retention and performance. The blade thickness is 3.5 mm and has a satin finish. The drop point blade is the ideal choice for this type of knife, as it is the most versatile. On the blade spine there are two areas with jimpings: the first near the handle, to favor thump grip, while the second is near the tip as an aid for precision cutting work. Also in the upper part of the tang has been made a very spaced knurl which, in addition to giving a better grip on the instrument, is particularly nice from the esthetical point of view. The intended use is given by the size, in fact, the Saddle Mountain Skinner has a blade of 10.6 cm that makes it versatile to different types of use, while the Hidden Canyon Hunter is equipped with a blade of only 6, 8 cm long, but rather wide and characterized by an adequate curvature of the cutting edge and by the presence of the finger choil, which make it useful for skinning work and precision cuts. The handle is made up of two thin scales in Dymondwood (laminated wood with very thin veins), juxtaposed to the tang and stopped by Chicago screws with a torx head. The grip is good and the shaping of the scales makes the knife well-structured from an ergonomic point of view. At the end of the tang there is a lanyard hole. As an alternative to Dymondwood, for both models, there is a version with G10 scales to which the kydex sheath is associated. The two knives come with a valuable leather sheaths. In the case of the Saddle Mountain Skinner the sheath is configured for belt carry (vertically), while the Hidden Canyon Hunter model, given its compact size, is equipped with a sheath suitable for the horizontal port with ambidextrous belt loop. On both sheaths we find the logo of the manufacturer. The price of the Saddle Mountain Skinner is $160 , and that of the Hidden Canyon Hunter is $140. Similar for shapes to the Saddle Mountain Skinner, but slightly more compact in size, the Benchmade Grizzly Creek is the ideal hunting pocket knife. The drop point blade, 8.9 cm long and 3 mm thick, is made of CPM-S30V stainless steel (58 - 60 HRC) with satin finish. As for the previous knives, on the blade spine there are two zones with jimpings, one in correspondence of the thumb rest, and the other near the tip. The blade is opened by acting on the ambidextrous thumb studs fixed to the top of the blade. The knife is equipped with the patented AXIS®Lock mechanism. In the rear part of the handle there is a small buttonhole which facilitates the opening of the gut hook. Also in this model the handle scales are made in Dymondhood. The generous dimensions of the handle guarantee the right handling and a good grip. At the index position, the scales are contoured on both sides, thus making the grip on the instrument more ergonomic and, at the same time, facilitating the access to the thumb-studs. The Grizzly Creek is equipped with a removable steel pocket clip, configured in tip-up position.